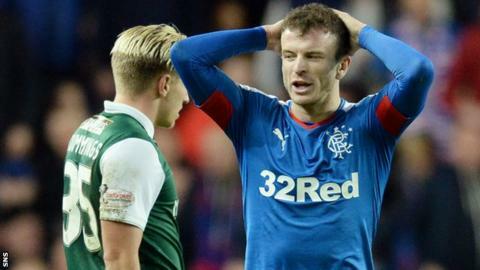 Midfielder Andy Halliday has had his red card in Rangers' 4-2 win over Hibernian reduced to a yellow, the Ibrox club have announced. Halliday was sent off for violent conduct by Bobby Madden after barging into Fraser Fyvie during the Scottish Championship game on 28 December. But Fyvie was later banned for two games for simulation after holding his head in the immediate aftermath. Halliday is free to play in Sunday's Scottish Cup tie against Cowdenbeath. Rangers said: "The red card shown to Andy Halliday in last week's 4-2 victory over Hibernian has been reduced to a yellow card following a successful appeal by Rangers. "The midfielder was dismissed for violent conduct for an alleged headbutt on Fraser Fyvie. "But, after the Hibs player was banned for simulation, Halliday's red was reduced to a caution for adopting a threatening and/or aggressive attitude."